"A MEMORY OF THE HAPPINESS OF US JUST BEING FRIENDS"
We were all very fortunate to spend some very happy times with Priya with the numerous interesting projects related to the VVOGA. We were all from different age groups and most of us did not know Priya the school girl. As we look back to the times we served the OGA, we see Priya as an iconic figure in the OGA. Priya shunned limelight and loved to keep a low profile. She was gifted, very skillful, talented, versatile and always a perfectionist in what she did with a heart of gold. With Priya's failing health she knew how to keep her spirits high and took life one day at a time. She told us that none of us are here forever and that we all have to bid farewell to this world when time comes. But we did not expect her to go so soon! We had planned so much with School celebrating 100 years in 2017. We will miss her love and guidance..
Priya may be gone but her memory will live on in our hearts forever. 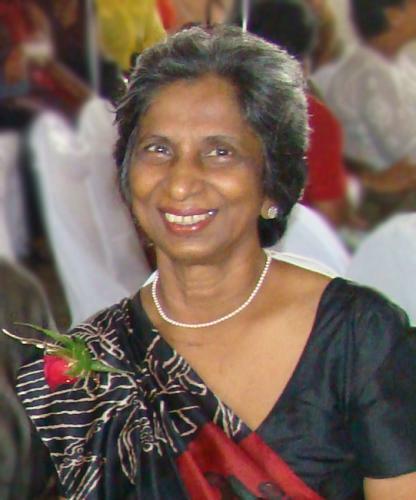 May she attain the supreme bliss of Nibbana.